Helene Slavin combines contemporary action painting and classicism, guided by the forces of fractal geometry. Like so many ingenious ideas in this world, fractal painting originated by accident. Helene Slavin compares her discovery to the story of toasted ravioli in St. Louis, when ravioli pasta was mistakenly boiled in oil, creating the crunchy, browned noodle, at Angelo Oldani’s on the Hill in the 1950s. Slavin was mixing blue paint when it splattered. She noticed how the forces of nature spread it into a pattern of its own across the white lid of the paint can. “That changed my creative life, seeing that,” says Slavin about the formation that she would soon identify as a fractal, or a repeated pattern at varying degrees of magnification that was first defined in geometry by Benoit Mandelbrot in 1987. She experimented with her discovery by putting paint on the edges of a lid and observing it slide over the rim and down the side. 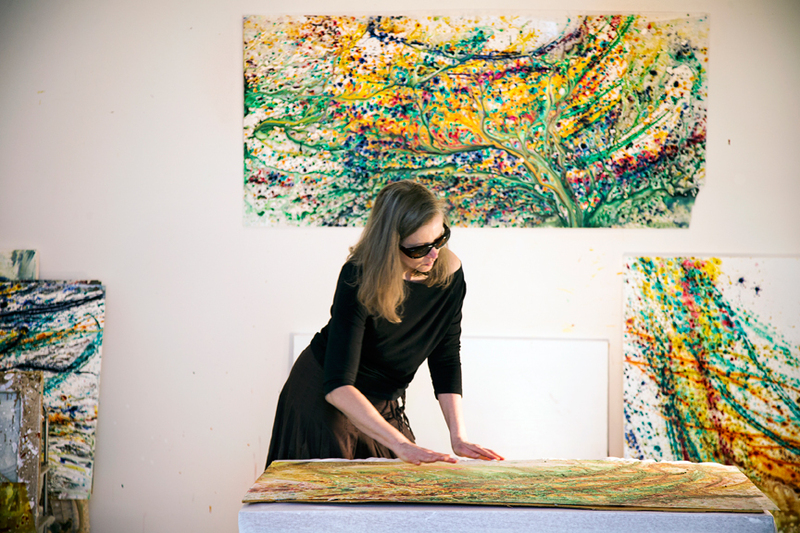 It was then that she decided to try a completely new path and process with her painting. Using the basic forces of gravity, pressure, heat and friction, she departed from the landscapes and figurative pieces that encompassed her past works. 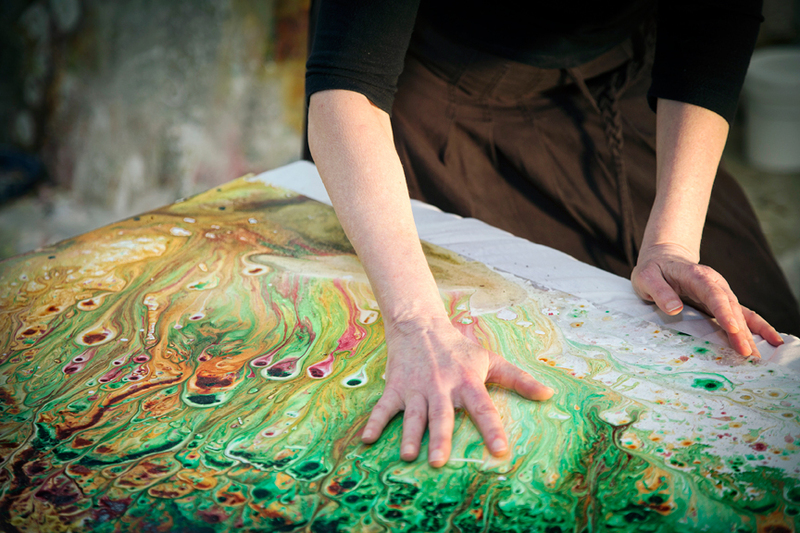 Slavin created her first composition using her fractal painting process in 2010. Walter Metcalfe purchased Wilde Bloemen. “I wanted to create this beautiful negative and positive composition, so I looked at a Rembrandt landscape, and I cut out the Rembrandt shape, and I threw the paint through the open shape,” Slavin says. 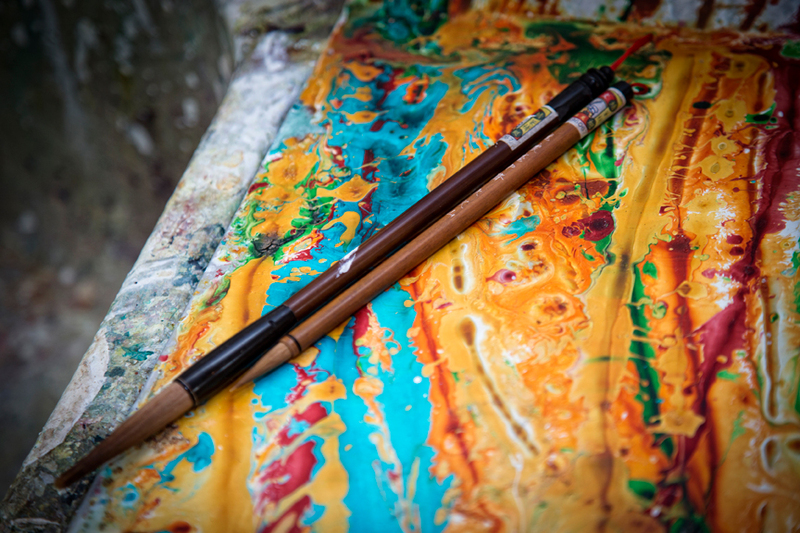 Ever since then she has been exploring, studying and developing fractal geometry with acrylic paint. Her color theory focuses on a classical color palette. “I have a core color, which is this amazing gold, and it’s tied to all other colors that I use,” Slavin says. She ties complimentary colors to each other to make the color unified and luminous. Luminosity is something that Slavin has been uncovering and expanding in her work for the upcoming show at the Phil Slein Gallery. These newest paintings are on transparent plastic sheets and light pours through them. Slavin states, "These works reference nature because the contours of the universe are controlled by fractal forces, both microscopically and macroscopically. Both micro-organisms and the galaxies are fractals, as are the systems of our bodies, such as our circulatory and nervous systems". 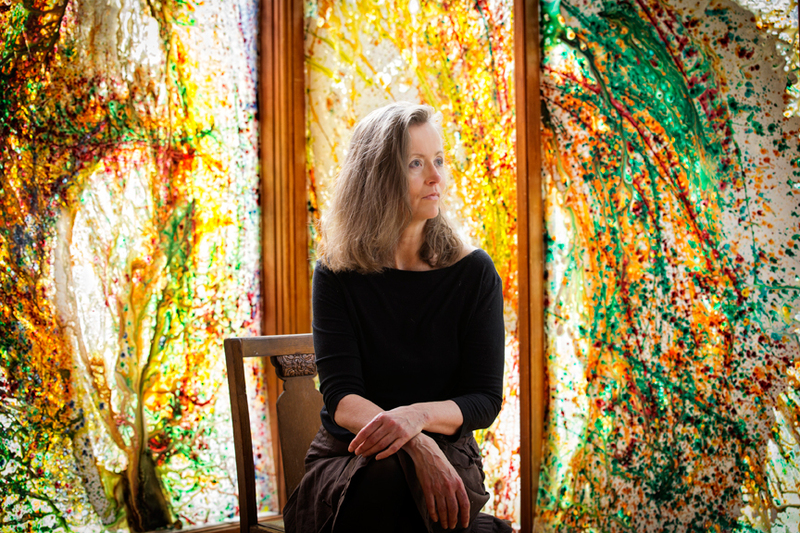 To see the fractal formations in Slavin's new compositions, visit her at the Phil Slein Gallery, throughout the month of August, with opening reception on the 8th, from 6-8 pm.